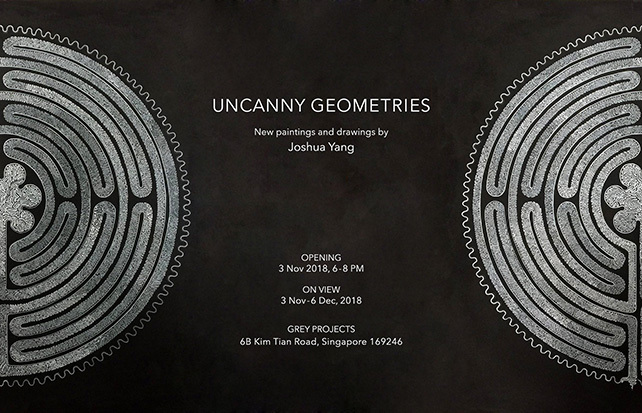 In these recent paintings and drawings, Joshua Yang explores the geometric configurations found in the icons and places of worship familiar to believers in Singapore. Rules of proportion and composition such as the golden rule are not simply principles of formal aesthetics married to mathematics, but a visual mathematics as a pursuit and adoration of perfection, beauty as a sign of order, symmetry and periodicity as evidence of infinity and transformation. As the mathematician Carl Friedrich Gauss quipped, God arithmetises. These geometries are highly generative of surface and dimensional complexity, creating spatial volumes, perspectives and ornamentation. The painted surface, in Joshua’s hands, become a blueprint for an architecture of the interior, mystical, body.